Finding clothes to wear to work that don’t cost an arm and a leg can be a daunting task. 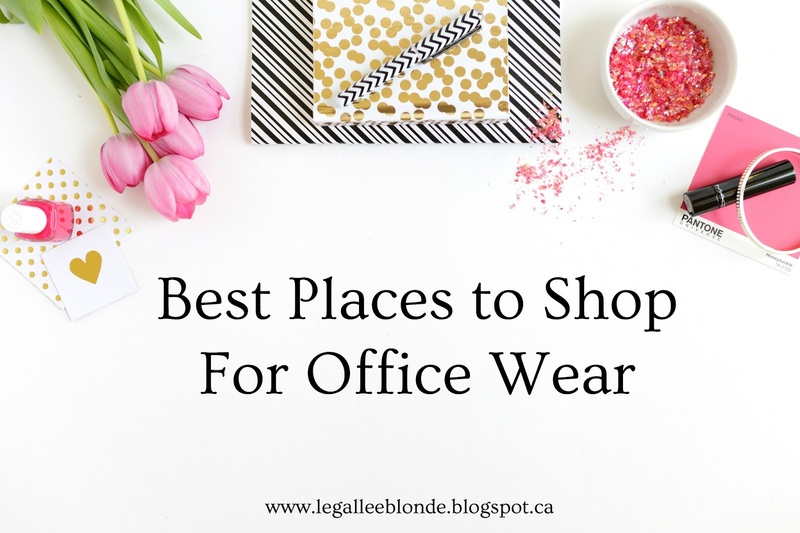 Below is a round-up of the places I think are best for office wear. I’ve also picked out some favorite currently available items (so many beautiful pencil skirts!) from each of these stores. Enjoy! Pro: SO many options. Nordstrom is the mecca for wear to work shopping. My personal favorite brands for office wear are Halogen & Anne Klein (both extremely affordable). I also love Theory (though their clothes are much more expensive). Con: They have far more online than in store. This means a lot of shopping without trying on. If you are in America though, they have a free shipping & returns policy so buy a ton and just return what doesn’t fit! Shipping is $10 to Canada. Pro: Feminine work wear styles. High quality material. Con: Expensive. I find that shopping their sale section online is that best way to get affordable items. Pro: Timeless, Classic items. You can wear J Crew pieces season after season and still be fashionable. Con: Expensive. Styles don’t fit all body types (I hear many women complain that J Crew just doesn’t fit them right. Try some items on and see how they feel for you). Pro: Affordable, classic pieces. Also- lots of “mix and match” items with different cuts of pants, skirts & blazers all in the same fabric/color. Con: Lower quality material. I find the stitching is more likely to come undone, hemlines are more likely to fall, etc. Pro: Extremely affordable. “Trendy” items. Con: Some of their “work wear” items are not the most work appropriate – sometimes they make v-necks that are a little low, slits that are a little high, etc. Pro: Quality materials. They are also really quite good with returns and exchanges. "How to Shop the Nordstrom Anniversary Sale if you are in Canada"
Love all of those stores you showed! Thanks so much! Ooo I always forget about Asos- I definitely need to shop there more! These are some great picks for working ladies. My favorite online go-to is Nordstrom. Their shipping is fast too. Thanks Sophie, Im so glad you like them! Ahh I definitely love Nordstrom. I bought a ton of great stuff during the NSale!